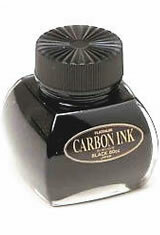 Originally released in May of 2001, the Platinum Bottled Carbon Ink is known for its intense black color. The Platinum Carbon ink was originally released in cartridge form but is now available in a bottle as well. The fountain pen ink is water resistant and light fast. The Platinum Bottled Carbon Ink(60ml) Fountain Pen Ink usually ships within 1 business day unless otherwise specified. Each Platinum Bottled Carbon Ink(60ml) Fountain Pen Ink we sell is guaranteed to be genuine, authentic and will arrive brand new & unused! Great ink! Very black! Love it! I really like this ink. It is like writing with liquid pencil. There is a graphite sheen to it. Writes very smoothly, feels lubricated. Permanent, but will smear a tiny bit. May feather and bleed through cheap paper. A nice alternative if you care about permanence. This is a reasonably priced waterproof ink that’s a serious black. I use this ink primarily as a “sharpie” ink in Platinum preppy highlighters that are eye-dropper converted. It works well for that purpose. I’ve also used it in a flex pen, dip pen, and fountain pen, and haven’t had any issues with flow. That said, I never let it sit for more than a day, and cleaned thoroughly. This ink is very black, but tends to smudge on papers like Rhodia and Clairefontaine. Plein air urban sketcher uses ink and watercolor when sketching most of the time. Need a permanent ink for drawing that stays put when covered with watercolor washes. This ink will bleed through on Strathmore 400 60 lb. sketch pad. Works superbly on journals designed for watercolor washes. No bleed through and no running when covered with washes. Been looking for this for several months now. I use this in a Sailor fountain pen with a fude nib. I am a happy sketcher now! I like this ink because it is fully waterproof (more than Noodler's black in) but it is not easy to find paper/notebooks to use with as it feathers and ghosts on most papers that I've used it. So far, Clairefontaine Triomph pads adn Clairefontaine notebooks are ok with it and Canson bristol paper pads (for drawing) but notebooks such as Rhodia (unexpected) webbooks, rhodia R cream color series and most others are not good due to feathering or ghosting/showing through on other side of paper. Rhodia regular white paper pads and dotted pads worked ok with it. Will have to find better ink that is waterproof also and feathers/shows through less than this Carbon ink. Some swear by De Artematis? document ink (spelling?) so will check that one one day.